For the Port of Galveston, the major news for 2018 is the continued expansion of cruise products and related services available, according to Interim Port Director Peter Simons. Carnival Cruise Line is moving the Carnival Vista to Galveston later in the year replacing the Breeze. The Vista will sail alongside the Liberty and the Freedom. “To accommodate the Vista we are in the process of doing some infrastructure upgrades in Cruise Terminal No. 1,” said Simons. Last fall, the port also welcomed the Vision of the Seas, and Simons explained that while she was originally intended to be a seasonal product, she is replacing the Enchantment of the Seas on a year-round basis. “We will have three Carnival and two Royal Caribbean ships year-round, and Disney seasonally from October to January,” he added. The current scheduling has two ships in port on Saturdays, two on Sundays, one each on Mondays and Thursdays, and Disney on Fridays. “We have completed the expansion of Cruise Terminal No. 2, and when we did the design for that, we planned for larger ships and more passengers. Both of our terminals are able to handle bigger ships and more capacity,” he said. “What we are doing though on the channel side is adding mooring structures to accommodate the longer Carnival Vista, and we are also finishing a mooring improvement project at Terminal No. 2 that will enable us to handle even larger ships in the future. We are upgrading the main mooring to be 200-ton bollards – the longer dock will also allow us easier access to the loading doors. Simons said the port is talking to cruise lines about how to fund the new terminal. He said the port’s options were either bank financing or teaming up with a cruise line. Meanwhile, he is also looking at how to provide the next generation of ships with LNG. At press time, Galveston projected just short of 1.9 million passengers embarking and disembarking on some 258 sailings for 2017, up from 1.7 million passengers for 2016. For this year, the forecast is for 308 sailings and more than 2 million passengers, according to Simons. “We see a lot of people coming down a couple of days early for special events, so there is a fair amount of extra local spending in connection with the cruise traffic. The vast majority of the passengers are drive-ups regionally and usually from the lower Midwest, but even as far north as Illinois and South Dakota. The fly-ins are typically from the West Coast. “There is also a wide variety of things to do both on Galveston Island and in the vicinity that we are working with the cruise lines on for pre- and post-stays,” he added. Simons, who joined the port in 2012 and was director of operations before being named interim port director, credited the port staff, the longshoremen and the stevedores for Galveston’s growing cruise traffic. He said it was a team effort with very attentive and hard-working people, making the cruise lines feel comfortable here and helping to grow their business. 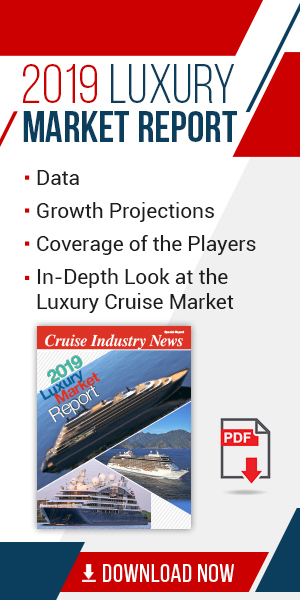 Get an in-depth, behind the scenes look at the North America cruise market and the ports that make it happen in the 2017-2018 Winter edition Cruise Industry News Quarterly Magazine. Subscribe today.